As a Keeper, Serenity is tasked with protecting the delicate balance between the creatures of the world: Vampire, Witch, Were, and Human. Her kind exists to ensure that no single race sways the balance, dooming the world to destruction. They're on the brink of extinction, with no sign of return. Now only two remain, and Serenity’s last brother is facing death, leaving her standing alone against a never-ending tide of vampires, all wanting one thing: power. Then she meets Ray Synclair, a history professor in training with a passion for centuries past, and the harsh reality of her limited time comes crashing down on her. He is her weakness. His mortality is the countdown on Serenity’s life, and with each passing second, it comes closer to the end, for both of them.Because the only way to kill a Keeper is to kill their partner . I was hooked on the synopsis alone and I have a feeling that Serenity Cardea's emerald eyes will be kryptonite... and I wasn't wrong. I found this a very emotional novel, you wouldn't need a reading kit but nevertheless you'll be entranced by Serenity's voice. Poignant notes of longing, love, hope, despair and finding bliss with Ray and their sweeping love story that will span decades. Michelle Birbeck gave me an amazing soulmate story, the kind we romantically dream about of having for ourselves. But the problem is how do you choose between eternal bliss in exchange for death? Will you trade your immortality and family for several years of happiness with someone intended for you? The choice was excruciating but Serenity and Ray made a big leap of faith only to be separated by unexpected events. Living the next couple of years chasing shadows with lingering memories that used to be sweet but is slowly starting to get bitter. Serenity's melancholia, regret and the cruelty of fate, finding her true love only to be taken away from her. The painful process of coping that nobody is spared from even Serenity, her long life didn't give her immunity from the pain, if anything Ray's is the last straw and his loss is the hardest to bear. I fell into the depths of her emotions and the complexities of being THE LAST KEEPER, seeing all those deaths and for once I see the burden of immortality. I have to forcibly pace myself because I don't want the story to end. Serenity is a wonderful heroine and at times too wonderful she was starting to frustrate me. I wanted her to crush her enemies but instead she gives them mercy, I wanted her to be mad and unleash her anger due to Ray's disappearance but she deals with it with grace. I enjoyed reading her story because she is the total opposite of myself, I'm not supernatural being but her humanity is exemplary and her and Ray's relationship is something we all want to have in our life. As your heart beats, so does mine. When your heart sleeps, so will mine. The character development in this story is its other strength. Usually secondary characters fade into the background but not in THE LAST KEEPER. Each individual has their own clear voice, unique from the others and none of them remained stagnant. I loved Helen and Jane as well as the fearsome Poppy Baruti and the rest of her little coven. 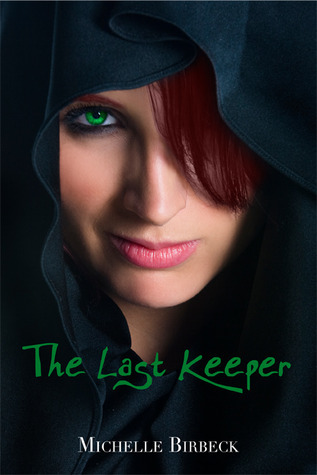 I have read a lot of vampire-hunter books and countless romance stories but THE LAST KEEPER is the most insightful one I've read in a long time. Michelle's play of words are simple but Serenity's pull is magnetic. This is one of those books that will sneak up on you. This sounds like a very good book! I am going over to GR and adding it right after I am done here. And you are right, that cover is just striking. I'd notice it a mile away. I'm glad to see the insides match the outside when a lot of books seem to fall short of that. Love a book that sneaks up on me!! I love it's Suped Up!! Thank you for the introduction to a new book.